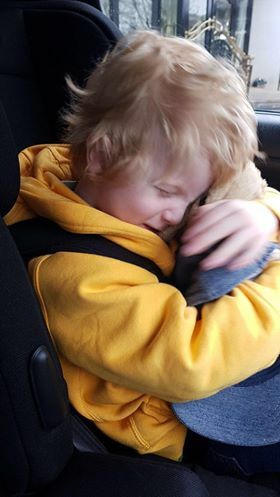 A much loved lost teddy bear, who has been a comfort to Naas boy through heart surgery and sickness, was returned to him yesterday by a kind hearted lady from Craddockstown. Little Sebastian Stewart was thrilled to be reunited with 'Burpy' yesterday. “When we lost him, you could see the bottom lip drop. He was devastated. It was unbelievable to get him back. When he saw him, he just took him and grabbed him, and he brought him to bed last night, and he even brought him to school today,” said his mum Sarah. She explained how the family printed off flyers after Burpy was lost on April 14. They put them up on social media and appealed for the return of the beloved teddy. “He was actually given to him by his granddad, so it had sentimental value too. Gaelscoil Nás na Riogh were brilliant. We put the posters up there and all the parents were asking if we had found him. The whole community really got behind us,” she said. The Leinster Leader put up the poster on our website and Maureen Mulvey got in touch. “We thought we lost him in Swans but he must have fallen out of the car outside Smyths and Costa Coffee. Maureen saw him and handed him into Costa Coffee but when she saw your post, she went back and got him. We were thrilled,” said Sarah. Sebastian was the same size as Burpy when he was born, and has been with him constantly, especially throughout the first two years of his life, when he spent a lot of time in Crumlin Hospital. Well in this case, miracles came through thanks to Maureen. Sebastian is in good health now, but he attends Crumlin yearly, and will require a valve replacement in his teens. With Burpy beside him, the five year-old must be the happiest boy in Naas today to have his beloved teddy back.